Coconut Flake "Bacon" - Vegan Bacon! 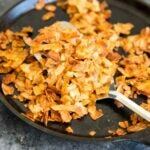 Coconut Flake “Bacon” – Coconut chips/flakes baked with soy sauce or tamari, maple syrup, liquid smoke and a touch of sriracha. Vegan bacon! True story: The first time I heard the term “coconut bacon,” I thought it just meant coconut-flavored bacon. Turns out it’s actually unsweetened coconut CHIPS (not flakes) with flavorings to make it taste like bacon! And no, it doesn’t taste like coconut. Since I’ve been trying out other meat substitutes like jackfruit, I thought it would be fun to try vegan bacon too! I tried at least 4 different versions of coconut bacon. This version though? It’s grandpa approved. If you know my grandpa, you would know he’s a big bacon guy. Seriously wish I had a video of it. Obviously he knew I wasn’t giving him real bacon, so once I told him what it was, he took back a little bit of his excitement. Meat-eaters can’t be converted in one sitting, guys. They get pretty wary about meat substitutes. But I still take his first reaction to be the most credible. It sounds weird, but measuring the coconut chips can be tricky depending on the brand you’re using. The bag I got from Trader Joe’s said there was less than 2 cups inside, but I measured close to 5 cups! That must mean that they “pack” it when it’s measured (like you would brown sugar). Other recipes I’ve seen I haven’t seen any mention of packing. Something to just be aware of when you’re making these! You want the coconut chips to only be lightly coated with the liquid. 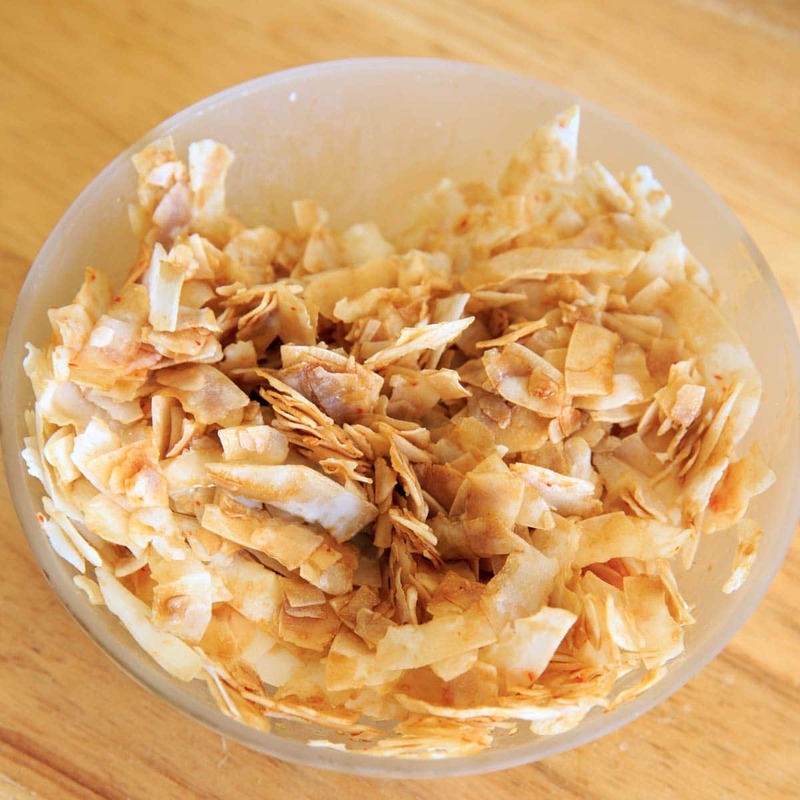 If it seems soggy, measure in more coconut chips. Side note/life lesson: be very careful with liquid smoke bottles! The first time I went to try this, the bottle fell from the cupboard and broke. Liquid smoke everywhere. My kitchen smelled like a barbeque for a week. Also: What do I call this? Fak-on? Coco-con? Baco-nut? I’ll work on it. 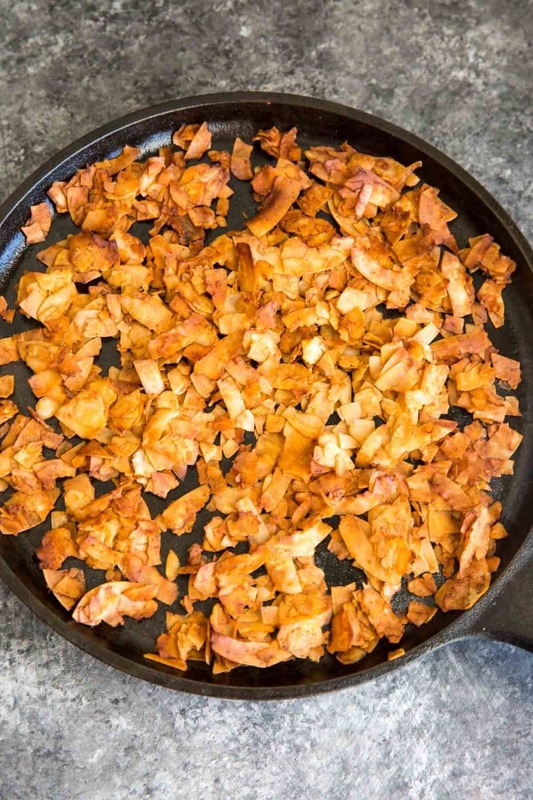 Coconut Flake "Bacon" - Coconut chips/flakes baked with soy sauce or tamari, maple syrup, liquid smoke and a touch of sriracha. Vegan bacon! Add coconut to a small bowl. 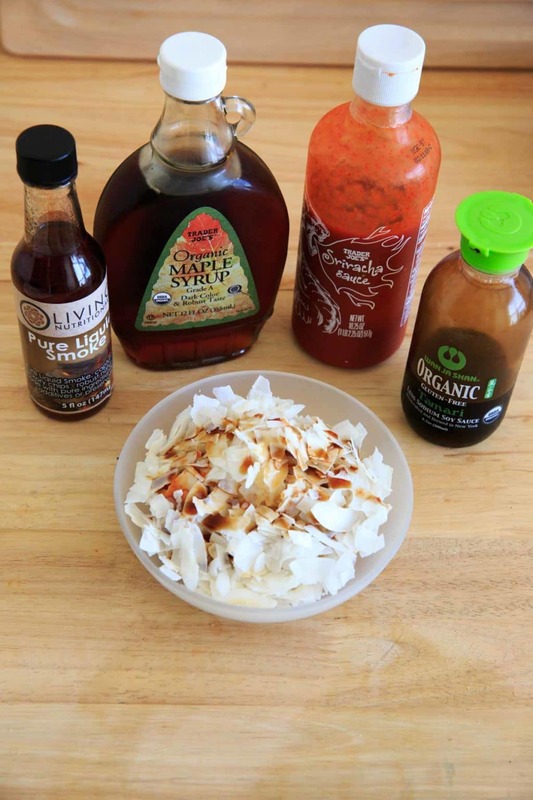 In another small bowl, combine tamari sauce, liquid smoke, maple syrup and sriracha. Pour over coconut chips and cover evenly. 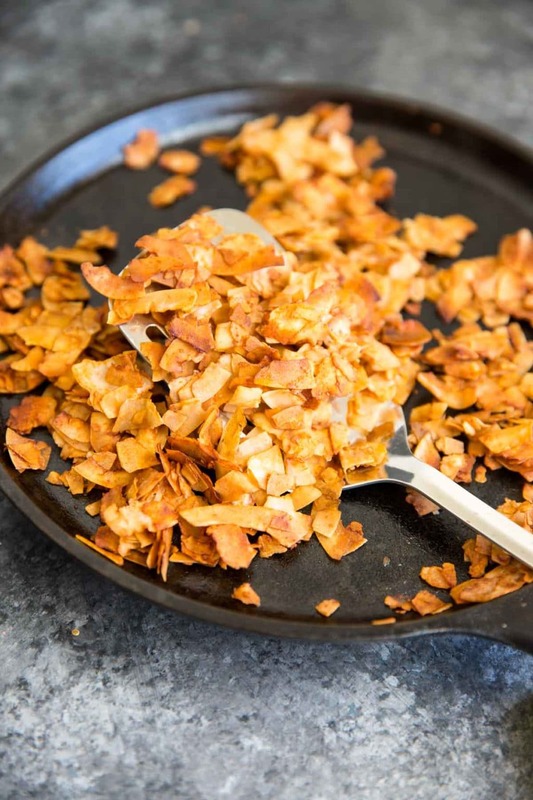 Spray a cast iron pan or cookie sheet (I use coconut oil spray) and spread coconut chips in an even layer. Bake at 350°F for about 15 minutes (or until crispy), tossing with a spatula halfway through. Serve on salads, sandwiches, eggs, etc. 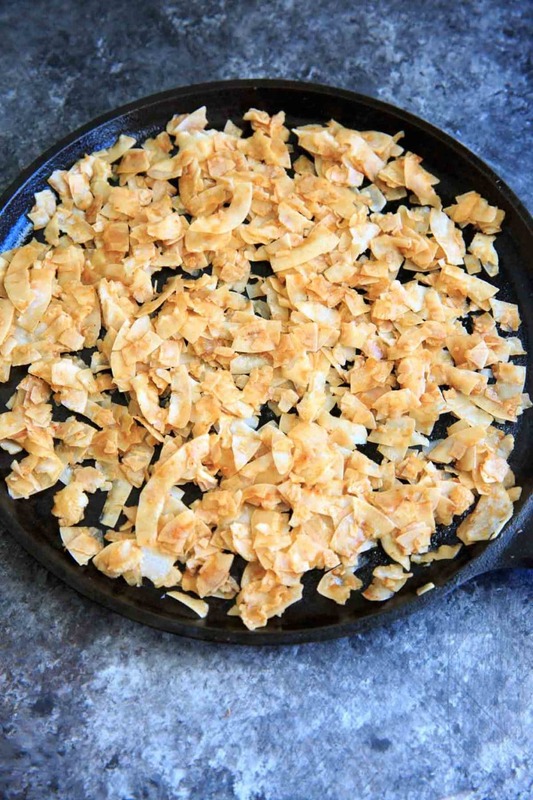 You want the coconut chips to only be lightly coated with the liquid before baking. Depending on the size and brand of your chips, measurements could vary slightly. If it seems soggy after mixing in the liquid, add in more coconut!